She has the same expressions and optional parts as the first release back then in 2009, but her Striker unit will be based on the design from Strike Witches 2. Oh, and she might also have the new faceplate system. This Nendoroid will be priced at 4000 Yen and scheduled for September release – which is pretty doubtful since it is Phat Company who will be in charge of this Nendoroid. 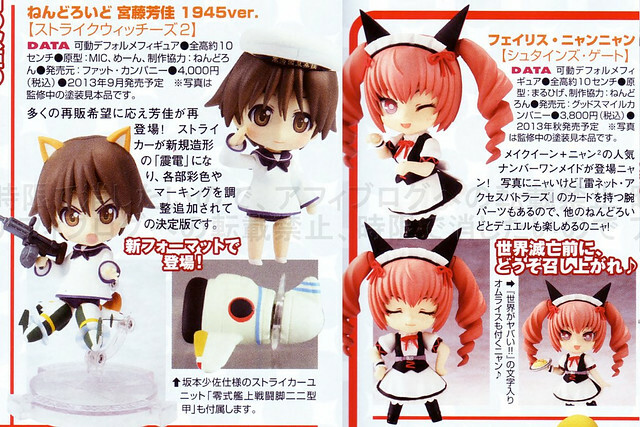 Moving up the right side of the magazine scan is our long awaited Nendoroid Feyris Nyan Nyan from anime/game series Steins;Gate. She is fully colored and … oh my! It is an overload of cuteness! … I mean, look at her twintails! 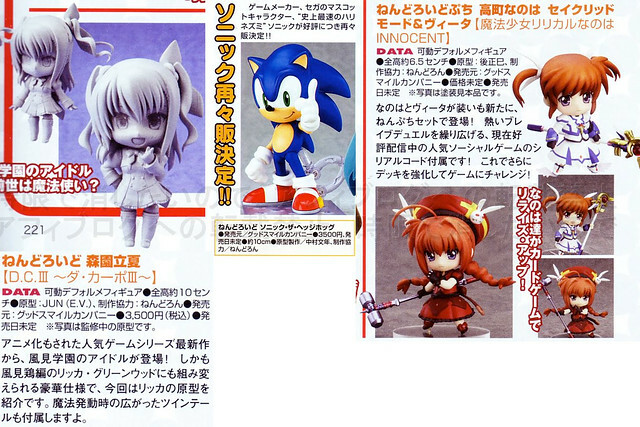 The second part of the magazine scans contain some article about Nendoroid Morizono Ricca from Da Capo III, Nendoroid Sonic who seems to be getting a re-release, Nendoroid Petite Takamachi Nanoha and Vita. … and last but not least is the prototype of Mr. Tony Stark in his 42th metal suit, albeit in Nendoroid form. Yes, Nendoroid Iron Man Mark XLII is based on the recent movie Iron Man 3, and this time, the Nendoroid will also include Tony’s head swap, not just his expression. So … what do you think, Nendonesian? Which Nendoroids are you most excited for? This entry was posted in News and tagged da capo, feyris, ironman, magazine scan, miyafuji yoshika, morizono rikka, nendoroid, nyan, sonic, steins gate, strike witches, takamachi nanoha, vita. DEFINITELY getting another Ironman nendo!